Este reporte también está disponible en español, aquí. The Colorado River, diverted and channelized and intensively managed, only rarely has enough water to flow even 20 miles past Morelos Dam, the last dam on the river, near the California/Arizona/Baja California border. The river’s limitrophe reach – the roughly 22.5 mile stretch from Andrade to San Luis that separates Baja California from Arizona – is generally considered the uppermost extent of the remnant Colorado River delta, with some of the most extensive stands of native cottonwoods and willows left on the lower Colorado River and one of the few areas where the river still occasionally has enough water to exceed its banks and reach its floodplain. Because of this, there has been intense restoration interest in the limitrophe reach for more than a decade. In recent years, however, concern has grown that deteriorating groundwater conditions in the lower portion of the limitrophe will limit the success of restoration efforts. Groundwater Dynamics in the Colorado River Limitrophe describes and explains the changing groundwater conditions in and adjacent to the Colorado River’s limitrophe reach, and analyzes the impact of groundwater pumping on these overdraft conditions. The key question underlying this study asks how changing groundwater conditions in the limitrophe could affect the sustainability of planned habitat restoration projects. 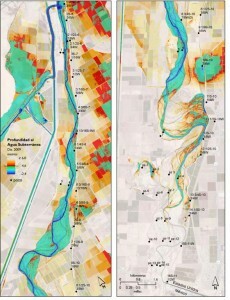 This study indicates that, even after the exceptionally dry period of 2005-2009, when surface flows failed to reach the gage at the downstream end of the limitrophe on 90 percent of days, more than a third of the channel through the limitrophe still exhibited connectivity with the water table, and roughly two-thirds of the limitrophe still had a water table that remained within the reach of the roots of cottonwoods and willows. The plunging water table at the downstream end of the limitrophe suggests that the final five miles of the river within the limitrophe may not respond to efforts to restore riparian habitat, at least not without a long-term commitment to supplemental irrigation, but areas upstream appear well-insulated from the recent drawdown and would benefit from restoration activity, such as that proposed by the recent Minute 319. Lee el reporte Dinámica del Agua Subterránea en el Tramo Limítrofe del Río Colorado (PDF).